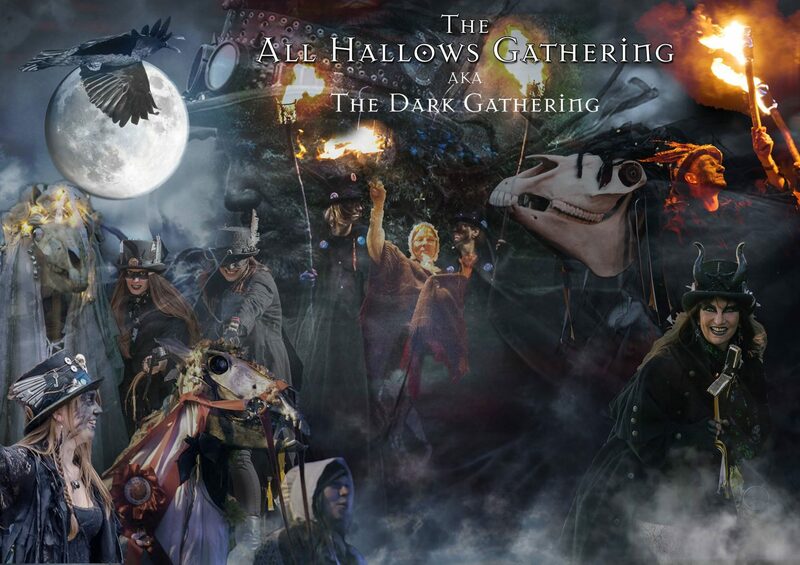 As you can see this year we have a spectacular line up of performers from far and wide to attend our annual Dark Gathering. 🙂 Let me run though them and give you a bit more background. By popular demand, David Pitt is once more presenting a drop-in Mari Lwyd Workshop. This year it will be held in the Library at the Museum of Witchcraft & Magic. I’m sure many folk who bravely trudged up the steep hill to Boscastle Village Hall last year are relieved to hear this! 😉 This workshop is free but donations are appreciated to go towards costs. A new Morris side to the Gathering is Domesday Morris who come from Stoke-on-Trent, Staffordshire. This year’s Evesham Stick was presented to Domesday Morris. Not only for the quality of their dancing (there was such a high standard of dancing this year there couldn’t not have been one winner if that was the only criteria) but that as a family-orientated side they are inclusive of the children, of all ages – they don’t just drag them along but involve them fully with kit and the music and dancing. They are also a side that have impressed us with their inclusion of the public and our decision was reinforced when, after being presented with the Evesham Stick they didn’t perform their show dance, but instead had a mass dance for public and other Morris alike. Well done Domesday !! For now, here’s a few videos to enjoy. Founded in 1995, and based in Rochester, Kent, Wolfshead and Vixen Morris have spent the past twenty-three years performing Border dance – arguably the most primitive and exhilarating of the Morris traditions – with a Pagan and Gothic edge. They have appeared throughout the south of England (and have even ventured north of Watford on occasion) – in their signature all-black kit they are a familiar sight at events from festivals to village fetes, even dancing at a book launch or two. They dance to a variety of traditional and original music, with a Gothic feel and a mesmerizing drumbeat. Wolf’s Head and Vixen are the only Morris side to have won the prestigious Green Man Shield, awarded to the most outstanding side at Rochester Sweeps’ Festival each year, for three years in a row. “Wolf’s Head and Vixen are extraordinary”. Cole Moreton, The Independent on Sunday. “As if the Pogues joined a biker gang of vampires, and then took up Morris dancing”. Paul Waters, Blackwatertown. During the afternoon break from Morris performance we will have again, the fantastic local male voice choir singing sea shanties and Cornish songs, the Boscastle Buoys! There’s a new Mari Lwyd team coming to the Gathering who also sing and dance, so there’s a treat in store for any Boscastle householders who invite the Mari Lwyds in their homes for luck! Mari Pontypwl will also join with the other Maris to meet Penkevyll the Lands End Oss at the Museum for the main pwnco. “It was a warm day. The small Celtic settlement by the coast were not expecting an invasion, they were busy working the land and preparing for the winter months ahead. A band of warriors approached from the hills. Saxons! Searching to settle away from Mercia and the colliding tribes. Searching for a piece of land to call their own. The Saxon chieftain called her warriors to lower their arms as they approached the small Briton settlement. The natives were few in numbers and rushed to grab weapons. A Celtic man stood tall, he carried a large axe. The natives looked confused as the armoured Saxons sheathed their weapons. The two clans talked, feasted and drank through the night. As the dawn drew close and the first light shone. Tre War Venydh was born. The warriors became one, they protected the land and people they loved. As you can see we will have an action packed and exciting line-up this year with some new faces which I’m sure will receive the customary warm Cornish welcome. I will announce any updates as and when they occur on this website. Remember to book accommodation early to avoid disappointment.